This page covers different video modes that are available on the OptiTrack cameras. Depending on the video mode that a camera is configured to, captured frames are processed differently, and only the configured video mode will be recorded and saved in Take files. Changing video types from the Camera Preview pane. 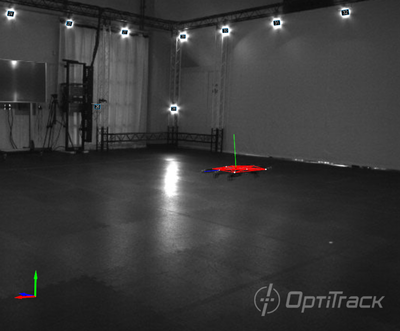 There are different video types, or image-processing modes, which could be used when capturing with OptiTrack cameras. Available modes vary slightly between different camera models, and each mode processes captured frames differently at both camera hardware and software level. Furthermore, precision of the capture and required amount of CPU resources will vary depending on the configured video type. 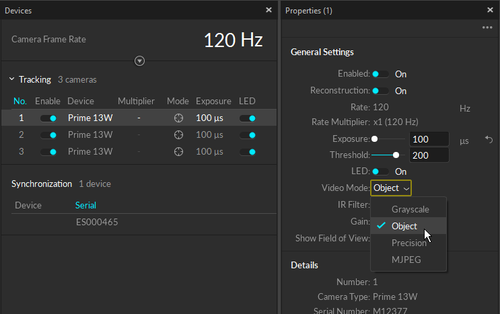 The video types are categorized into either tracking modes (object mode and precision mode) and reference modes (MJPEG and raw grayscale). 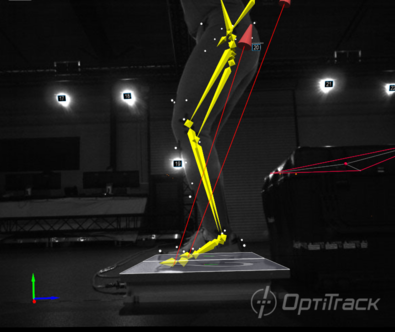 Only the cameras in the tracking modes will contribute to the reconstruction of 3D data. To switch between video types, simply right-click on one of the cameras from the 2D camera preview pane and select the desired image processing mode under the video types. Motive records frames of only the configured video types. Video types of the cameras cannot be switched for recorded Takes in post-processing of captured data. (Tracking Mode) Object mode performs on-camera detection of centroid location, size, and roundness of the markers, and then, respective 2D object metrics are sent to the host PC. In general, this mode is best recommended for obtaining the 3D data. Compared to other processing modes, the Object mode provides smallest CPU footprint and, as a result, lowest processing latency can be achieved while maintaining the high accuracy. 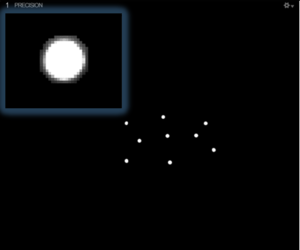 However, be aware that the 2D reflections are truncated into object metrics in this mode. The Object mode is beneficial for Prime Series and Flex 13 cameras when lowest latency is necessary or when the CPU performance is taxed by Precision Grayscale mode (e.g. high camera counts using a less powerful CPU). Supported Camera Models: Prime series, Flex 13, and S250e camera models. 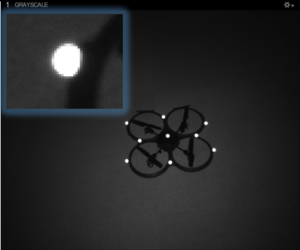 (Tracking Mode) Precision Mode performs on-camera detection of marker reflections and their centroids. These centroid regions of interests are sent to the PC for additional processing and determination of the precise centroid location. This provides very high-quality centroid locations but is very computationally expensive and is only recommended for low to moderate camera count systems for 3D tracking when the Object Mode is unavailable. Supported Camera Models: Flex series, Tracking Bars, S250e, Slim13e, and Prime 13 series camera models. (Reference Mode) The MJPEG -compressed grayscale mode captures grayscale frames, compressed on-camera for scalable reference video capabilities. Grayscale images are used only for reference purpose, and processed frames will not contribute to the reconstruction of 3D data. The MJPEG mode can run at full frame rate and be synchronized with tracking cameras. Supported Camera Models: All camera models. (Reference Mode) Processes full resolution, uncompressed, grayscale images. Grayscale images are used only for reference purpose, and processed frames will not contribute to reconstruction of 3D data. Because of the high bandwidth associated with sending raw grayscale frames, this mode is not fully synchronized with other tracking cameras and they will run at lower frame rate. You can check and/or switch video types of a selected camera from either the camera properties, viewports. Also, you toggle the camera(s) between tracking mode and reference mode in the Device pane by clicking on the Mode button ( / ). If you want to use all of the cameras for tracking, make sure all of the cameras are in the Tracking mode. Open the Devices pane and Properties pane and select one or more cameras listed. 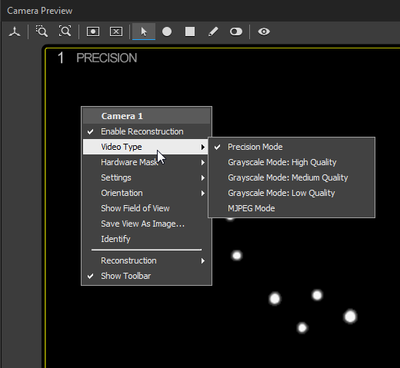 Once the selection is made, respective camera properties will be shown on the properties pane. Current video type will be shown in the Video Mode section and you can change it using the drop-down menu. Under the Perspective View pane, right-click on a camera from the viewport and set the camera to the desired video mode. 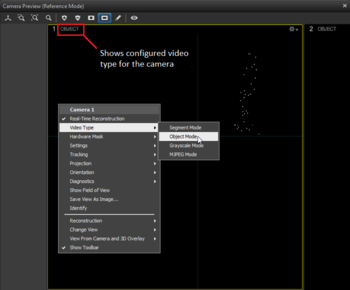 Under the 2D camera preview pane, right-click on a camera's view and change the video type for the selected camera. Cameras can also be set to record grayscale reference videos during capture. These videos are synchronized with other captured frames, and they are used to observe what goes on during recorded capture. 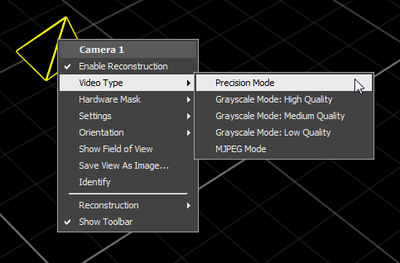 To record the reference video, switch the camera into a MJPEG grayscale mode by toggling on the camera mode. Compared to object images that are taken by non-reference cameras in the system, grayscale videos are much bigger in data size, and recording reference video consumes more network bandwidth. High amount data traffic can increase the system latency or cause reductions in the system frame rate. For this reason, we recommend setting no more than one or two cameras to the reference mode. Also, instead of using raw grayscale video, compressed MJPEG grayscale video can be recorded to reduce the data traffic. Reference views can be observed from either the Camera Preview pane or Reference View pane. Tip: Latency can be monitored from the status bar located at the bottom. Note: Grayscale images are used only for reference purpose, and processed frames will not contribute to reconstruction of 3D data. The Reference View pane can be accessed under the View tab → Reference Overlay or simply by clicking on one of the reference view icons from the main toolbar ( ). This pane is used specifically for monitoring reference images from either a live capture or a recorded capture. When reference cameras are viewed in this pane, captured assets are overlayed over the video, which is very useful for analyzing the events during the capture. This page was last modified on 26 July 2018, at 00:11.